On Monday 21st January, Israeli occupation forces arrested at dawn, four Palestinians from Rumanah and Qubatiya villages in Jenin, and a Palestinian and his son from Aqaba village in Tubas governorate. Security sources revealed that Israeli forces arrested, Farid Ghazi Mahajneh, 27, from Rumaneh village after they raided his parent’s house and rummaged with the contents. In Qabatiya, Israeli forces arrested Jasser Amin Nazal, 32, after they raided his house and also rummaged with the contents. In the village of Aqaba in Tubas governorate, Israeli forces arrested Sulaiman Radi al-Said, 55, and his son Firas, 28, after they raided his house, searched it and rummaged with its contents. Israeli forces stormed al-Arqa village, west of Jenin, amid firing of sound bombs toward Palestinians’ houses as a provocative step. It’s worth mentioning that the villages adjacent to Apartheid wall and settlements southwest of Jenin, are always exposed to a daily to Israeli raids and aggressive acts. 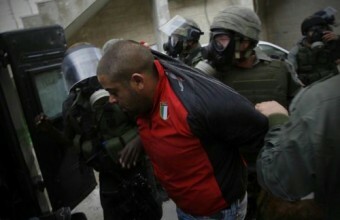 Israeli occupation forces also arrested five Palestinians from al-Aroub refugee camp m north of Hebron. Media spoksperson of Popular Committee to Resist Apartheid Wall and Settlement in Beit Ummar, Mohammad Awad, said Israeli forces raided at dawn, several houses and arrested Hassan Abdul Karim al-Titi, 22, Baha’ Jihad Adawi, 18, Hesham Jabr al-Titi, 19, Ali Abbas Abu Mariam 20, and Anas Kamel Kawamleh, 18, and transferred them to an unknown location.